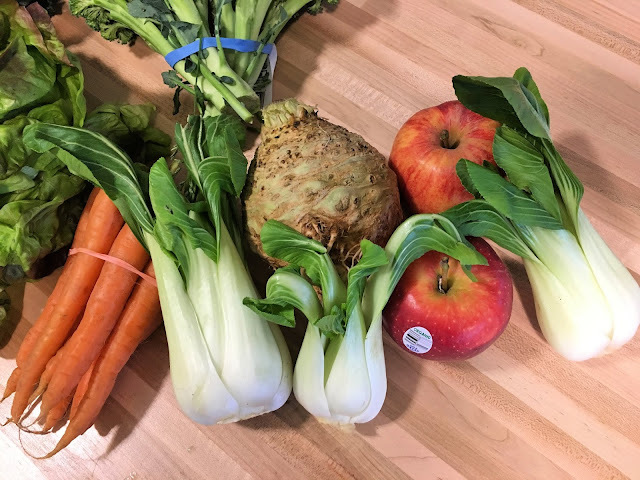 We receive Organics to You every other week, and I find that a big batch of soup uses up several root vegetables from the box, and is a good dinner option with a nice loaf of Artisan bread on a chilly fall/winter night. I ran across this recipe after receiving celeriac in our box this past week, and we loved it! YUM. 1. Heat the olive oil in a large, heavy soup pot over medium heat and add the onion, leeks and a pinch of salt. Cook, stirring, until tender, about 5 minutes. Add the celeriac and a generous pinch of salt, cover partially and cook for another 5 minutes, stirring often, until the celeriac has begun to soften. Add the potatoes, apples, water or stock, salt to taste. Bring to a boil, reduce the heat, cover and simmer 1 hour, or until the vegetables are very tender and the soup is fragrant. 2. Blend the soup in batches in a blender (cover the top with a towel and hold it down to avoid hot splashes), or through a food mill fitted with the fine blade. The soup should be very smooth. Strain if desired. Return to the pot. Stir and taste. Adjust salt, add freshly ground pepper, and heat through. Serve in small bowls or espresso cups, garnished with thin slivers of celery leaves. Recipe from Soup to Start by Martha Rose Shulman.